RSF is pleased to announce a new PRI loan to Honey Heaven Wholesale (D.B.A. Hummingbird Wholesale), a bulk food distributor offering high quality organic, local, and regional food crops to wholesale customers from Bellingham, Washington to San Francisco. Hummingbird is located at the southern end of the Willamette Valley in Eugene, Oregon. RSF financing allowed Hummingbird to purchase an environmentally friendly freight truck that will be used for deliveries along the route between San Francisco and Bellingham. 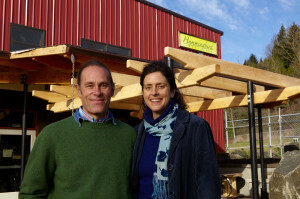 In 2003, Charlie and Julie Tilt purchased Honey Heaven Wholesale and eventually changed its name to Hummingbird Wholesale. Their mission is to serve people and the planet by providing regionally grown, high quality nutritious foods that nourish the body, mind, and soul. Today, Hummingbird contracts directly with regional farmers whenever possible for organic and transitional staple crops and helps to market these products to consumers. They believe that sourcing locally makes ethical, nutritional, and logistical sense—this practice builds trust, deepens relationships, keeps money in the region, and helps strengthen the fabric of community. They sell over 900 different products including animal feed, honey, beans/legumes, grains and flours, granola, nuts, seeds, sprouting seeds, and spices and teas. In 2012, 50% of total sales came from items processed and grown in the Willamette Valley. In Eugene, Hummingbird uses two cargo tri-cycles to deliver its products; in 2012 an impressive 250,000 pounds of goods were delivered via bike. 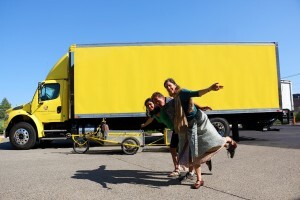 For deliveries outside of Eugene, the company uses three small trucks. RSF’s financing allowed Hummingbird to purchase an environmentally friendly freight truck that meets California Air Resource Board (CARB) standards, a set of state regulations aimed to lower vehicle emissions. “With the capitalization of a high-efficiency and low-polluting delivery truck we were able to drastically improve our delivery systems,” says Charlie. “Our new vehicle produces 1/66 of the pollutants of the 2006 diesel truck it replaces and offers a 50% increase in fuel economy.” This new truck will enable Hummingbird to double its current capacity for deliveries to consumers.